Ooooh! She’s sassy– and getting away with it. I guess that’s one reason why Sedrick ostensibly didn’t let her become Arthur’s driver. Mordred definitely got the best line in this one; wasn’t expecting that out of him. 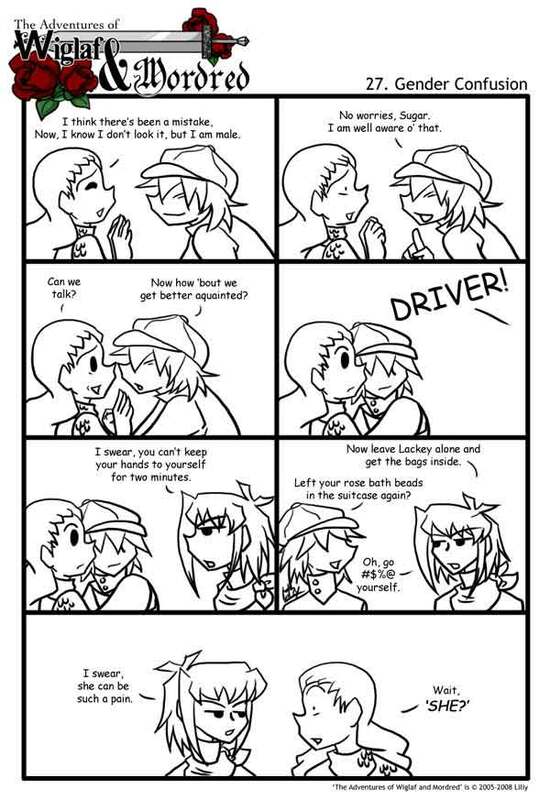 XD And, Driver… she’s fun. ^_^; Will she be jumping Wiglaf anytime soon? Okay, maybe I don’t have a guys name. Ignore my previous comment. Heh ‘is reaction is ‘illariioius. Technically, I think, most of the time it’s Mordred that’s mistaken as a girl. See the couple joke at the airport…then again, security could be kidding. Wiglaf looks too much like a girl to be sayign that with such surprise. I can understand appearance wise that Driver is, not very feminine but, wouldn’t her voice give it away? Men have deeper voices than woman, shouldn’t her voice be a give away that she’s a she not a he? Driver has a masculine voice. It’s not a super-low baritone by any means, but it’s definitely easy to mistake for male. If Driver were to ever be animated, ideally she’d have a male voice actor (or a woman used to playing men). :lol2: :lol2: :lol: :lol: I konw he’s soo funny. This is the same guy that likes black roses. Roses!